You’d be surprised what judges and lawyers would do for profit. Even if it means death? 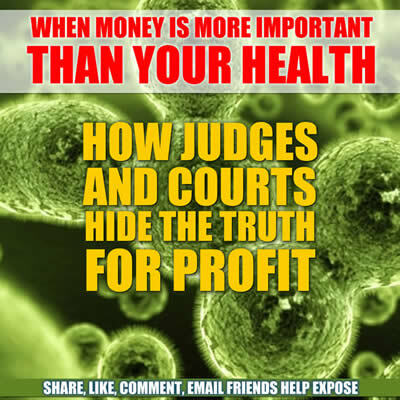 Find out more about how health risks are hidden or ignored by our courts by totally dishonest people who care only about profit. Kelman and five additional owners of GlobalTox, now known as Veritox, sued me for libel in May 2005, in the San Diego Courts for the sentence, “Upon viewing documents presented by the Hayne’s attorney of Kelman’s prior testimony from a case in Arizona, Dr. Kelman altered his under oath statements on the witness stand.” Their claims was that it was a maliciously false accusation of perjury. First officers of the San Diego Superior and Appellate Courts systematically fixed the SLAPP suit to the false finding of libel by making my writing appear to have made a false accusation that it did not make. I.e. that I accused Kelman of lying about being paid to author the ACOEM version. Wrong. I correctly exposed that he was paid by a think-tank to author the U.S. Chamber’s version. See Justice Judith McConnell’s 2006 anti-SLAPP Opinion acknowledging that Kelman altered his under oath statements when faced with a prior testimony; while making it appear that I falsely accused Kelman of lying about being paid to author the ACOEM mold statement. (the anti-SLAPP opinion is chalked full of mistatement of fact) Then see how they systematically fixed the case again in my 2010 Appellate Petition for Review – which of course, was denied. Veritox are toxic tort expert defense witnesses for the U.S. Department of Justice. They’ve been paid over $1,000,000.00 for their services to the federal government. Many court documents were falsified along the way causing the jurists to be conspiring to defraud without subject matter jurisdiction, and thus having no immunity from prosecution for the criminal acts. In 2008, Judge Lisa Schall and her clerk, Michael Garland, falsified the Judment document after trial, causing it to be void to be used for any purpose. The local jurists, Kelman and his attorney, Keith Scheuer, continued to use Schall’s falsified legal document for five more years to harass me, while knowing it was fraudulent and void; and that they had no subject matter jurisdiction. In addition to fixing the SLAPP suit to the false finding of libel, officers of the San Diego courts REPEATEDLY concealed that Mr. Kelman committed perjury to manufacture an alleged malicious reason for my exposing his FRAUD. A second suit was then filed in 2010 by Kelman and his attorney, Scheuer, to try to silence me of the fraud upon the local courts in the first suit, aiding the continuance of scientific fraud in courts, nationwide. DA Dumanis knows it, but REPEATEDLY refuses to prosecute to stop the public fleecing!